Another device has exploded, this time a Moto G4 Play in Brazil. This would be the second case of this kind in recent times, as a Moto G4 also took the fiery route last month. Smartphone explosions are becoming something of a norm these days. There have been a number of reported incidents in the near past, with the infamous Galaxy Note 7 fiasco in 2016 and the Redmi Note 4 accident that took place a few months ago some of the major cases. Yet another device has exploded, and this time, it's the Moto G4 Play. According to the report, the G4 Play was plugged in overnight before it exploded. Going by the shown images, the device was plugged in with what appears to be a third-party charger, and that has been a common factor in similar cases. This isn't the first time a Motorola device has gone up in flames—there were reports of a Moto G4 doing so only last month, also in Brazil. Motorola is the dominant smartphone brand in the region, so having multiple cases from the same company isn't so ridiculous. 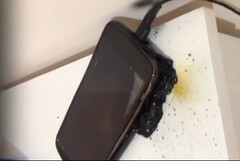 As seen in similar cases, the devices usually explode when their lithium-ion batteries are overstressed, either due to mechanical pressure or unaccommodating temperatures. The latter is likely the cause here, as the third-party charge may have sent excess power to the device, leading to a thermal overload. Here's a video of the aftermath.